San Jose, Calif. – Nov. 14, 2018 – Cohesity, the leader of hyperconverged secondary storage, today announced the results of a global survey that validates a critical problem plaguing enterprises around the world: mass data fragmentation. The survey of more than 900 senior IT decision makers revealed that 87 percent believe their organization’s secondary data is fragmented across silos and is, or will become, nearly impossible to manage long-term, which could have devastating consequences. Respondents cited growing fears around competitive threats, compliance risks, job losses, sinking morale, and missed opportunities to increase revenue by as much as 10 percent. Mass data fragmentation refers to the growing proliferation of data spread across a myriad of different locations, infrastructure silos, and management systems that prevents organizations from fully utilizing its value. 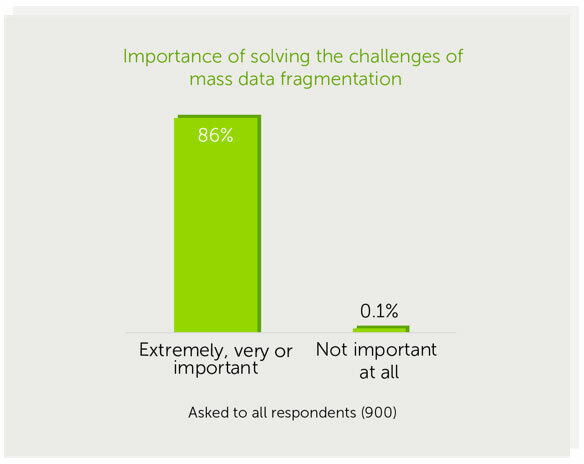 The survey, commissioned by Cohesity and conducted by Vanson Bourne, found that 86 percent of decision makers believe it’s important, very important, or extremely important to solve the challenges of mass data fragmentation. Respondents are employed by enterprises in the United States, United Kingdom, France, Germany, Australia, and Japan, across a variety of industries including financial services, healthcare, life sciences, media and entertainment, technology, and the public sector. The companies represented in the survey had average revenues of $10.5 billion. 35 percent of respondents reported using six or more different solutions to manage all of their secondary data operations. More than 10 percent of organizations use 11 or more solutions. 63 percent of organizations have 4-15 copies of the same data. 85 percent of respondents store data in two to five public clouds, and that includes 16 percent that store data in four or more public clouds. Mass data fragmentation has the potential to wreak havoc on IT teams and budgets that are already spread thin. The overwhelming majority of respondents believe it will take their IT teams more time to manage secondary apps and data – on average 31 percent more time, or an additional 16 weeks each year – if proper tools aren’t in place. And for those who believe their organization’s secondary data is fragmented, more than half fear they will exceed their IT budget due to spending on unnecessary storage. The survey also uncovered serious risks that mass data fragmentation poses to organizations. At a time when compliance regulations are front of mind for organizations, 91 percent of respondents said they were concerned about the level of visibility that the IT team has into secondary data across all sites. 49 percent believe that failing to address mass data fragmentation will put their organization at a competitive disadvantage. 47 percent said customer experience would suffer because fragmentation would make it impossible for their organizations to glean insights from secondary data. 38 percent fear massive turnover on the IT team, and 26 percent said that they or someone on their team would consider quitting. 43 percent believe culture within the IT team will take a nosedive because expectations are out of whack and the organization is not set up for success. 42 percent said employee satisfaction and morale would suffer. Ninety-one percent of senior IT decision makers said that if half of the IT resources their organization spends managing secondary data were redeployed to more business-critical IT actions, it could have a positive impact on the company’s revenues over a five-year period. Nearly 30 percent of respondents believe this adjustment in IT resources could increase revenues by at least six percent over a five-year period. And, nine percent say revenue could increase by 8-10 percent or more. With average revenue of companies above $10 billion, an 8-10 percent increase would translate to roughly $800 million to $1 billion in new revenue opportunities.